I photo of Matthew Mayfield I took a good while back ended up running in the April 2012 Popular Photography Lighting how-to column. How the hell I'm just blogging about this, I don't know. 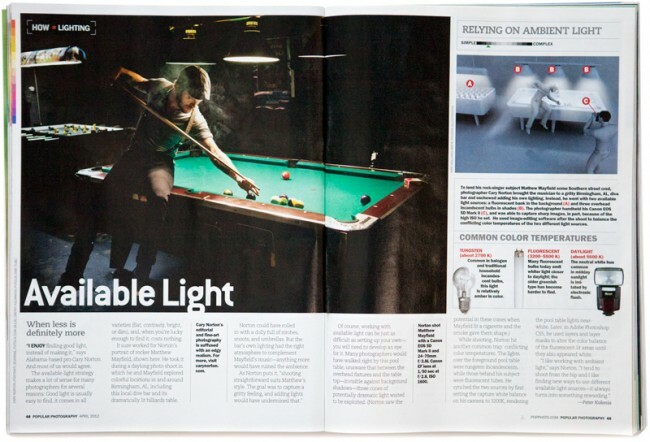 My favorite part is that I was in their lighting column about how to shoot available light. And I mean that sincerely. I see a ton of how-to stuff all over the place and so often it's all about adding lighting, how to strobe this, using X many lights to achieve this effect, etc, but less about using what exists. As much as I use strobes these days, I still shoot a ton of available light photographs because it's where my heart lives, I think. Maybe that's overkill. But really, so much of what I shoot for me, exclusively because it moves me, is almost always as it exists. Portrait. Landscape. Moment. Whatever. I often go with my gut, and my gut thinks in available light. This just got weird, I think. At any rate, I was honored to be featured. Extra honored because it was a shot about, in a sense, winging it and using what's around.